There is no information about any significant combat for Iranian F-14s during the 1970s, as the main reason Iran purchased F-14s was to intercept Soviet aircraft flying into Iranian airspace. In October 1978, two IIAF F-14As intercepted a high-and-fast–flying Soviet MiG-25 over the Caspian sea, forcing it to abort a reconnaissance run over Iran, in turn possibly ending similar Soviet operations over the country. By September 1980, the Islamic Republic of Iran Air Force (IRIAF) managed to make an increasing number of airframes operational, despite immense problems due to repeated purges of its officers. Some of those officers were executed; others were imprisoned, forced into exile, or forced to take early retirement. The IRIAF survived these times, and its Tomcats were to become involved in the war against Iraq, scoring their first kill on 7 September 1980. There is limited information available about the service of F-14s in the Iran–Iraq War. Western intelligence indicates that the IRIAF was in decline at the onset of the war in September 1980, and it is rumored that some level of sabotage was committed on the F-14s by either Americans or Iranians loyal to the Shah, during the Iranian Revolution. Following the overthrow of the Shah, most Iranian F-14 pilots and technicians trained in the United States fled from Iran, fearing their association with the Shah's regime, and their time in the United States would endanger them. Only two pilots out of the original flight class chose to remain in Iran. Their fears proved correct, and many of the original Iranian F-14 crews and technicians who remained were jailed or executed by the new regime. Eventually, several jailed F-14 pilots were released when war broke out with Iraq. The United States estimated that the IRIAF was able to keep between 15 and 20 F-14s operational by cannibalizing parts from other examples. The IRIAF claims a higher figure, and was able to assemble 25 aircraft for an 11 February 1985 fly-over of Tehran. Despite the embargo, Iran was able to acquire parts for its American aircraft, including the F-14, F-4, and F-5. Sources indicate these came via the Iran-Contra arms deal, collusion with Israel, or from domestic production. Iran has claimed that it has been able to produce all of the parts required, though US intelligence indicates that total is about 70 percent. GlobalSecurity indicates that Iran flew the F-14 in an AWACS-type role. To counter, Iraqi Mirage F1-EQs flew low-altitude profiles, popping up briefly to illuminate and launch missiles against the F-14s; several Tomcats were lost in this manner. GlobalSecurity also reports that less than 20 aircraft were still airworthy as of 2000, and cited one report that only seven can be airborne at one time. It was thought for many years that Iran used the fighter primarily as an airborne radar controller, escorted and protected by other fighters, but later information indicates this was incorrect. While the IRIAF did husband its fleet of F-14s, the aircraft were used aggressively when needed, even escorting strike packages deep into Iraqi airspace. Initially, the IRIAF F-14s flew intensive CAP patrols, some lasting nine hours, over main bases. IRIAF Tomcats often escorted tankers supporting strike packages heading into Iraq, scanning over the border with their radars and intercepting inbound Iraqi aircraft. With the AWG-9 radar and long range AIM-54 and medium range AIM-7 missiles, the Tomcats could be used as offensive weapons without leaving Iranian airspace. United States AWACS aircraft observed the downing of an Iraqi Tupolev Tu-22 "Blinder" bomber, and the downing of at least one F-14. Western sources estimate four kills against four to five losses; the official Iranian estimate is 35-45 kills, and 12 losses, all reportedly due to engine failure during combat. I am an unabashed Hasegawa 1/72 Tomcat kit collector. It did not start that way; just happened. I do not, however, purchase game/anime-related boxings so no Idolmaster or Ace Combat boxings, though these are often sold for a good price. So far, I'm missing about a dozen boxings, though every once in a while, I run across one that isn't grossly inflated in price. This is the latest one. 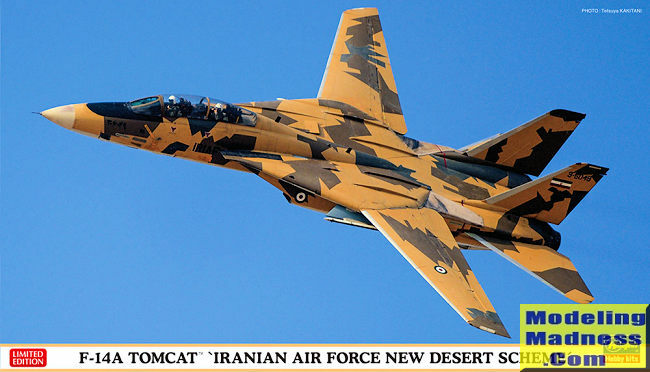 This is at least the third Iranian Air Force edition that Hasegawa has produced and it has the latest splinter type camouflage scheme. Naturally, that means a goodly amount of masking will be required, but the result will be a pretty cool model and besides, some enterprising aftermarket place could produce either decals or a mask that would help. 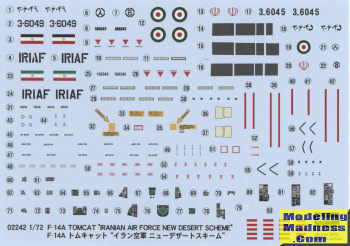 Hasegawa has also been known to release their initial issue Tomcat kit as a limited edition, but those are often easy to spot due to their lower price. This is the second tooling. Now I don't know all the nuances of the different block numbers or modifications, so don't shoot the piano player on this. I will say that it looks pretty much like what I'd expect the planes to look like. There is an early IR sensor, I don't see the later gun gas vents and the fins do not have the external bracings, though the parts are in the kit. The kit also has a TARPS pod, but I'm not sure the Iranians ever got that. Another neat addition to this boxing is a sprue or two of Russian weapons. Iran's Phoenix missiles are probably not serviceable and they did opt for easier to obtain air to air weapons, hence the new sprues with R-27s. These go on the inner pylons. The kit shows Sparrows and Sidewinders as options, but again, I'm not sure if that is an accurate option for this aircraft. Now to the standard stuff. There is a photo etch fret for things like inner canopy latches, instrument and consoles, afterburner details and such. This is actually etched stainless from what I can see so will be pretty sturdy stuff. Back in the cockpit, there are decals that can be used if you so wish. Two bang seats are fairly well done. All this will fit atop the nose gear well when it is built up. Weight is needed in the nose. The kit has a lot of inserts so one will have to be careful when installing these. Note also that holes will need to be opened for missile racks, fuel tanks and pylons. Wings can be built swept back or fully forward. For the latter, the slats and flaps can be extended. There are separate inserts for the area behind the wings depending on which you choose. The wings do not 'swing' so you make your choice and stick with it. Some cutting will be required for swept back. Landing gear is very nicely done and you get both extended and lowered nose gear. I doubt the Iranian planes use the lowered position as they are not catapulted from aircraft carriers. Main wheels have separate hubs so that will help with painting. Intakes are nicely detailed and, in my experience, installing these is usually the biggest headache of Tomcat kits. That and installing the separate nose section. All of the various little lights are separate bits as well so that won't be fun installing those. 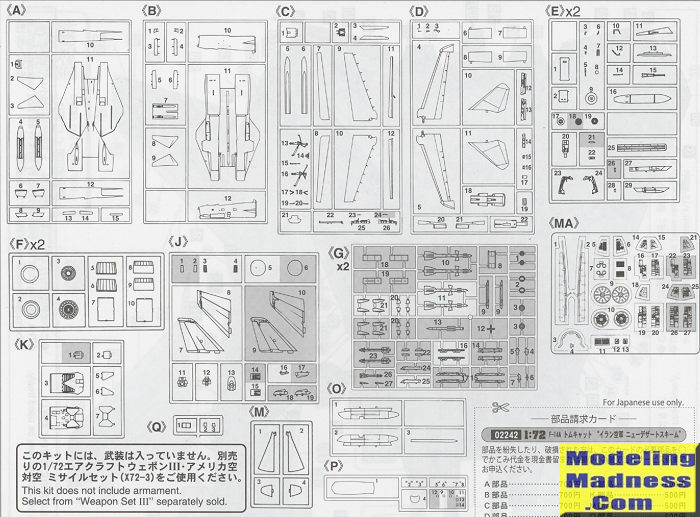 The instruction book is modern Hasegawa with Gunze paint references. There are a lot of colors needed for this as you can image. Other than the different camouflage schemes, the two markings options differ only by serial number. Decals are very nice and should work beautifully. Tons of stencils are included. Here we have yet another very nicely done limited edition boxing from Hasegawa. I am not sure just how well these sell outside of Japan since other companies have produced newer moldings, but they sure do look nice when they are done. I often wonder what Hasegawa will do since the Tomcat is now out of US service. It seems that IRIAF is good for an additional boxing as are games and such. It will be interesting to see if they start repeating subjects to keep the line going.